I dreamt last night that the Sekiseigumi was a ferocious beast chewing its way through a great noodle of udon on its way to devouring me as I frantically kneaded and rolled all the wheat I could find to save my life. I awoke in a cold sweat, and the visions of this premonition still haunt me. I must find more wheat. On the front line, when one soldier falls, the next must rise. It is no different when the enemy is hunger. Who among you will take up the spoon of mt fallen sous-chef rally to the cause of popoto soba? Each meal we prepare for the Sekiseigumi must be the best they've ever eaten, for any given feast can be warrior's last. If any one should fall tonight, let it be with the sweet Hingashi taste of rice vinegar on their lips. Much of our Hingan culture comes to us by way of Yanxia, most notably the art of tea. 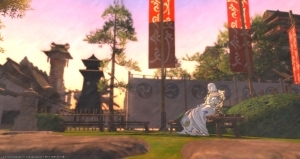 The mysterious enhancing properties of Doman tea may be no more than myth, but if the warriors of the Sekiseigumi believe in them, then they are as good as true. Buckwheat noodles steeped in savory broth and topped with a starchy paste created by grinding a raw mountain popoto. Doman tea An after-supper beverage naturally sweetened with dried persimmons. Widely popular in the Far East.